I was up early. 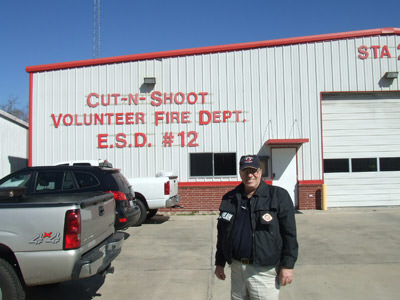 I called Tom Hart and got directions to “Cut and Shoot” Texas. Tom is a retired Detroit Firefighter. Tom ran at Engine 5 in the Cass Corridor before a duty disability ended his career. 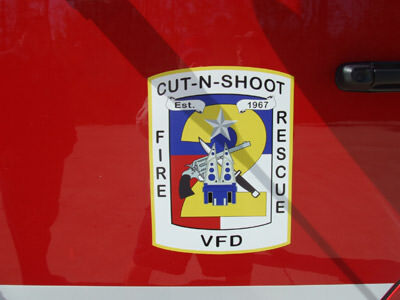 He is quite involved with the “Cut and Shoot” Fire department. 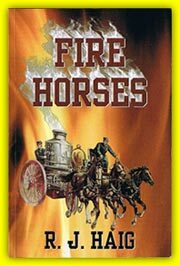 He has helped write grants and has been a wealth of knowledge for his young Firefighters. He is also the Department Chaplin. He and his lovely wife Jackie took me on a tour of the district. I met many on duty department members including Shane, Josh, Crystal, and Kirk. Kirk pulled out his rig so I could take pictures. Their fire district is twice the size of the city of Detroit. Tom said it was over 240 square miles. It is protected by a combination of 17 fire stations containing pumpers, ladder trucks, tankers, ambulances, brush rigs and all the equipment necessary to protect the public. It is run by a separate political entity with separate funding from assessed taxes. In Texas they make sure public funds are used properly. The new equipment is astounding. Everything is digital. When arriving on the scene of a fire the driver makes a selection and presses one button to activate water supply or the jaws-of-life, or any device that is required by the Firefighters. At the Blue Smurf Station, Shane, boss of the engine, explained how they respond to fires. They are efficient, dedicated men and women. They are the strength of America. It is an example of how good a fire department can be when you remove politics from the equation. 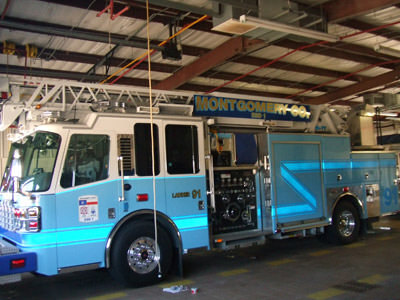 Boss Shane’s fire station is called the Blue Smurfs because their fire rigs are painted a sky blue color. It is the first time I ever saw blue fire apparatus. 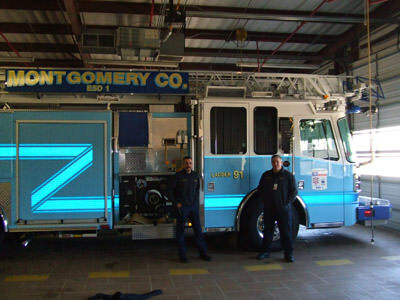 Shane told me there is only one other department in the country with blue rigs. I must admit they were cool to look at. 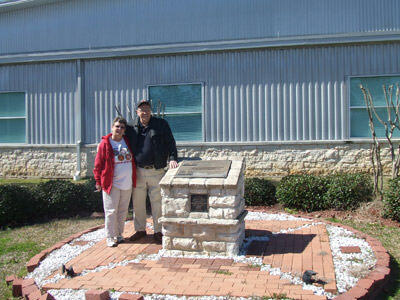 Tom and Jackie took me to a site in the center of the fire district where a memorial is erected to honor deceased Firefighters, including in the line of duty deaths. The last Firefighter lost at a fire was a young man named Gary Stalely who was killed in 2003. Firefighter Stalely and his crew were involved in an interior attack in a commercial building. They fought their way down a hallway and entered a fully involved room containing bottled canisters. Firefighter Staley was the lead man on the nozzle. Suddenly there was an explosion. One of the tanks of nitrous oxide ignited like a rocket hitting Staley squarely in the chest. He was killed instantly and consumed in a ball of fire. Firefighter Staley gave his life protecting the lives and property of the people in his fire district. It is the sad part of being a Firefighter. 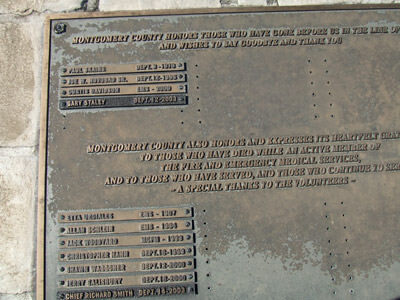 He is not forgotten and the memorial enshrines his name with the other heroes of the department. Tom and Jackie were great hosts. I hadn’t seen Tom in 40 years but it was like we were together just yesterday. Firefighters are a family. It was like seeing my brother Tom and my sister Jackie again. I have included pictures with this log entry. There was not a lot of driving today. I stopped in Ennis, Texas to get a good rest, wash clothes, and get an oil change on my car. I needed a lull in this breath taking road trip. I called ahead to Dallas to reaffirm my planned Tuesday meeting with Joyce Foy Spizer. She is a fascinating woman who writes books, screen plays, and has her own movie production company. I met Joyce last year at the Public Safety Writer’s Association conference. She amazes me with her energy. Her mind is quick and overflows with knowledge. She informed me that I should have stopped in Beaumont, Texas. I missed seeing the Firefighter’s Museum and the world’s largest fire hydrant. My daughter Lisa will be disappointed. Lisa is an aficionado of world record attractions. Lisa has seen things like Paul Bunyan’s axe, the biggest stove in the world, and Tom Thumbs Toenail. Next year I will stop at the museum in Beaumont. I am looking forward to tomorrow and my visit with Joyce Foy Spizer.